At first sight, this looks simple: Semicolon Separated Values and you are done. Not so fast Mr Smart Alec: watch the optional spaces! The best thing for problems like these is to start with an empty implementation that some units tests covering it. 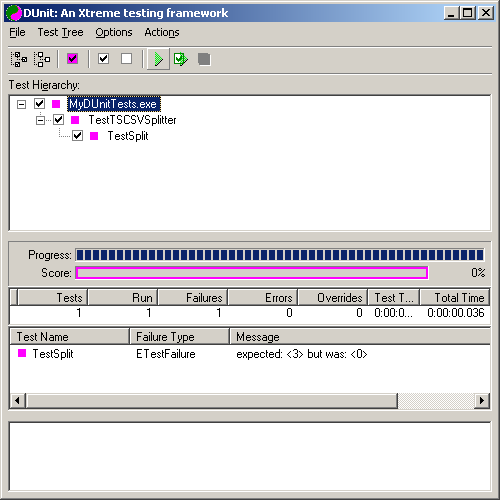 I use DUnit for Delphi unit testing. 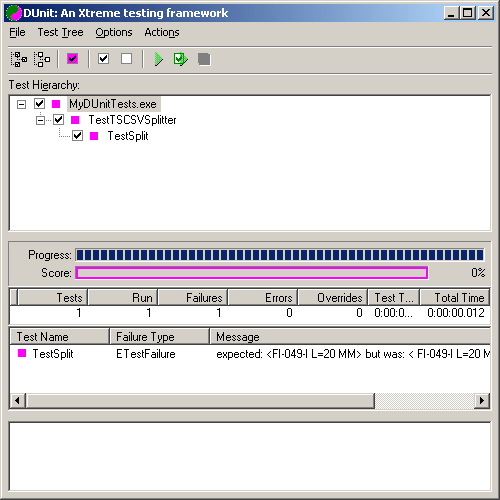 Unit testing should go with code coverage, but there are few Delphi code coverage articles. I’ll get into code coverage later on, as I’m working with two of the code coverage people to get this to work nicely with Delphi 2010. Mock objects can be a good addition to unit testing too, so in a future article, I will cover using mock objects with Delphi. All code will be in a DUnit project (as that is easier to setup for example purposes). In practice you will probably have your business logic in a library, and just add the business units to your DUnit test projects. in my projects, I usually have the directories like prj, src, bin and lib (for project, sources, binaries and .dcu files). In the DUnit project, lets start with the frame for the implementation unit. This frame defines the interface how to call the logic, and serves as a starting point to generate the unit test from. This covers the above examples in one test. You can create multiple test methods for that if you want (for more complex tests they get easier to manage). Note that if you do, each test method needs to be in the published section (so the test framework automatically sees it). In addition to that, the test methods cannot have parameters. For each run of each test method, the SetUp and TearDown are being called. Now you can step by step refine your implementation until all tests succeed. Use the semicolon (;) as a Delimiter to start splitting. Set the StrictDelimiter property to True (this will stop splitting on spaces and other characters <= #32). If you don’t, then TStrings will use spaces as a delimiter too, and you split across too many lines. Use the DelimitedText property to make the TStrings split it automatically into the indexed Strings property. The reason it fails is that one of the splitted strings contains leading spaces. So the final unit has only one line changed: add a Trim. This looks slow, and it probably is. But this code isn’t running a million times, so it does not need premature optimization. Now you can see the unit tests succeed: all the nodes in the tree are getting a green mark. Hope this sheds some light on unit testing. This entry was posted on 2010/09/08 at 06:00	and is filed under Agile, Conference Topics, Conferences, Delphi, Development, DUnit, Event, Software Development, Unit Testing. You can follow any responses to this entry through the RSS 2.0 feed. You can leave a response, or trackback from your own site. hm…, I don’t get the point. Using constants in Unit-Test is normal (you do the same in your test). So why you mention it? My point before the smiley was that normally, in code, I use constants for things that I repeat. Actually, you had a very good point: it is important to make sure that invariants should not vary. Looking forward to your article on using mock objects. It’s something I’ve been puzzling over to get right for some time now (also see my StackOverflow postings on that topic, e.g. http://stackoverflow.com/questions/2874669 or http://stackoverflow.com/questions/3448121). P.S. : See you soon in Berlin? I won’t be in Berlin during the Delphi-Tage. Since I already submitted for EKON 14, and Delphi Tage was originally planned the weekend before EKON, and my marching band is preparing for Tattoo on Stage in Lucerne the weekend after EKON, I simply could not make time, so did not submit proposals. Preparation for Tattoo on Stage and the autumn season of the marching band very much limits my time during and around weekends anyway, so maybe next year’s Delphi Tage has an easier timing for me. nice post with simple use of DUnit. Just a question: what’s the purpose of Strings[Index] := Strings[Index]; before you know you would need to Trim ? I used that part for debugging purposes: to see the individual splitted split strings. Thanks for the remark; I have added a comment to the code to make that piece more clear.